It’s official. With mobile browsers now accounting for 52% of global traffic, phones have surpassed desktop computers. Looking to expand your mobile reach? We’ve got you covered. Throughout this post, we’ll highlight easy ways to appeal to your site visitors when they’re on the go and manage your business when you are. Ever since the dawn of Mobilegeddon in 2015, having a website that looks great on all devices has become imperative to getting found organically within search results. In fact, 82% of the Internet’s top trafficked sites are mobile-friendly. Ready to make the switch? No problem. Our Template Gallery is full of modern web designs that come in a range of different business verticals, allowing you to select a professionally designed template that matches the vision of your business. And best of all – they’re free! Making your website mobile-friendly doesn’t end with a responsive website. In fact, there are a variety of things you can do to make your website easier to interact with on a smaller screen. One easy way Yola customers can get ahead of the game is by enabling Mobile Plus. 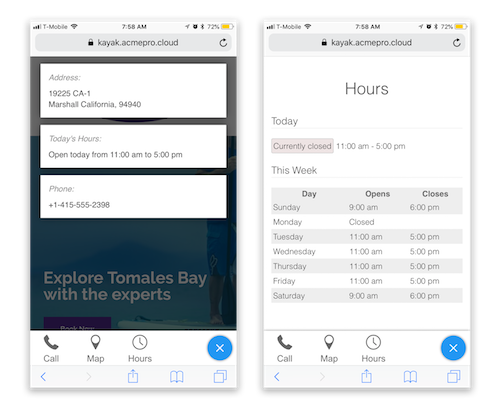 Mobile Plus, a premium feature available to Yola Silver and Gold customers, gives you the ability to add business hours, driving directions, and tap-to-call functionality, making it even easier for site visitors to get in touch with you. Learn how you can add Mobile Plus to your website here! With apps accounting for 85% of total mobile time spent among mobile internet users, having an app for your online business could be a great idea. In addition to gaining the appearance of a big business, you’re also able to proactively reach out to customers with push notifications, in-app coupons, and more. With companies like AppInteract, businesses can create their own app without any coding or technical knowledge. Note: AppInteract is currently running a contest where users who sign up get a 60-day free trial and a chance to win an Apple Watch. You can check out the giveaway here. In addition to being able to create a website that looks great on all devices, the mobile revolution has opened the doors to greater productivity tools, accessible right from the palm of your hand. And with Yola, you have instant access to apps, allowing you to manage your business whether you’re at home or on-the-go. Online Store subscribers can check on sales, update inventory, get in touch with customers, and much more! Learn how to manage your Online Store from the eShop app here. Want to check on your website analytics while you’re out of the office? No problem. Yola subscribers can gain access to free website analytics via mobile app through our marketing partner, SiteWit. To access your analytics via the mobile app, simply navigate to My Yola > Site Traffic > SiteWit. From there, select your website, then Mobile App. SiteWit will then lead you through downloading and accessing your site stats. What are your favorite mobile productivity tools for running your business? Let us know in the comments below!